For over 67 years, Bushnell has been a trusted leader in the optics industry. The American company specializes in optics and imaging and produces high-end optical equipment. With products ranging from binoculars, spotting scopes and telescopes to night vision equipment, rangefinders and rifle scopes, the Bushnell company has a product for every hunter and shooter. David P. Bushnell founded his company in 1948. He first made precision binoculars affordable to middle-class Americans via importing from manufacturers in Taiwan, Hong Kong and Japan who provided optics to his patented specifications. Eventually, Mr. Bushnell amplified his business with the production of spotting scopes and rifle scopes. The Bushnell company’s extensive product line covers nearly every optics category with outstanding models to choose from. If you’re an avid hunter, sports or outdoors enthusiast, you’ve at some point heard of Bushnell. In 2007, the company won an Editors Choice award for their Elite 4200 6-24×40 rifle scope from Outdoor Magazine. And in 2015, OpticsPlanet, an online retailer, awarded Bushnell as one of the most recognizable and trusted names in precision hunting, tactical and recreational optics and accessories. The Elite 4500 rifle scopes from Bushnell are extremely compact, rugged and feature RainGuard HD water repellent technology. The four times genuine power range provides maximum versatility for hunting numerous species of big game. With the inclusion of Ultra Wide Band Coating, hunting in low-light has never been better, easier or more manageable. The 4500 rifle scopes are offered at lower prices, but in no way does it mean the company cuts corners on design, engineering and overall performance. The 4500 series is basically a re-furbish of the successful 4200 series. Fully equipped with multi-coated optics, the Elite 4500 rifle scopes deliver amazing 94 percent light transmission across more than 300 percent of the visual light spectrum for outstanding brightness during early morning and early evening hours, when animals are most active. The Elite 4500’s waterproof tubes are recoil tested with 1,000 rounds of a .375 Magnum, so you can expect nothing short of superb reliability and security. And speaking of security or added security while hunting, it’s always good to have a backup with you — in addition to your long rifle. 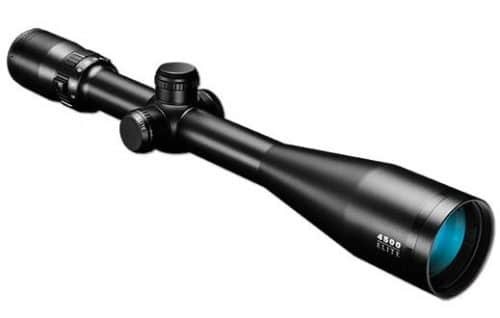 An all-around big game hunting rifle scope, the 2.5-10×50 is most often used in low-light conditions. With a patented, water-repellent coating (RainGuard HD), moisture from rain and snow will bead up and scatter less light producing a super clear, bright view. In addition, Ultra Wide Band Coating, an anti-reflective coating process is customized for every lens element in the optical path. It enables the best light from the front glass to the back of the eyepiece — in other words, guaranteed exceptional brightness across the light spectrum. The 4500 2.5-10×40 exemplifies multi-coated optical systems to deliver the brightest, highest-contrast images with the least amount of eye strain, and a fast-focus eyepiece guarantees the reticle is always sharp and images crystal clear. Additionally, all Bushnell Elite 4500 rifle scopes are O-ring sealed and argon purged for complete waterproof, fogproof and shockproof protection. Drop your rifle in a pond? No problem. The 2.5-10×40 rifle scope can endure complete immersion in water, still stay dry inside and the interior optical surfaces will not fog due to rapid temperature change or humidity. As previously stated, the Elite 4500 rifle scope is constructed with a one-piece argon-purged, aluminum tube and is recoil tested with 1,000 rounds of .375 H&H Magnum. No need to worry — your rifle scope is equipped for maximum reliability during very intense use. In addition, the 2.5-10×40 comes complete with 1/4 MOA fingertip, audible and resettable windage and elevation adjustments and side parallax adjustments. This carefully created Elite optic delivers exceptional performance at a very reasonable price and is a terrific all-around big game hunting rifle scope. The image quality is excellent, as the 40mm objective lens keeps your images bright even in fading light. There are many positives with this scope and one in particular is that the turrets feature rotation markings which prevent the shooter from getting disoriented while dialing through every revolution. This is extremely beneficial to long-range shooters. 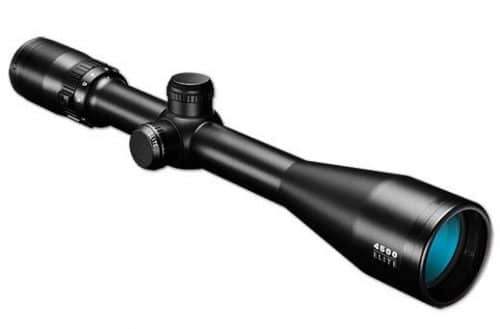 Lastly, the Elite 4500 2.5-10×40 also comes with a Multi-X reticle. 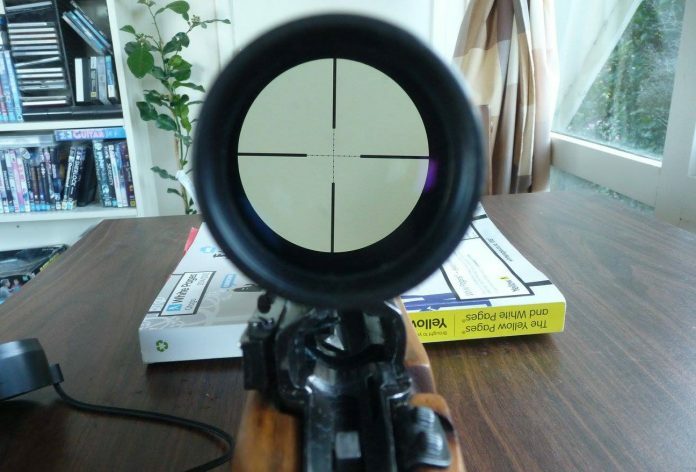 TIP: If you’re using a rifle scope with a rifle, you’ll also need a mounting base and rings. With proper spacing of the rings as well as the correct ring height, you’re ensured a proper line of sight. Additionally, this will greatly intensify your shooting experience. The compact, versatile Elite 4500 4-16×40 rifle scope is ideal for long-range hunting, varmint shooting or target shooting. Featuring RainGuard HD technology for optimal hunting even in the most difficult of circumstances, the patented, permanent water-repellent coating causes moisture from snow, sleet and rain to essentially bead up and scatter less light. The Ultra Wide Band Coating brings low-light performance to new heights, giving you the best light from the front of the glass and back to the eyepiece. The 4-16 magnification offers versatility like no other, giving you the freedom to hunt wide open spaces and shoot to longer ranges. The Multi-X Reticle is the classic reticle as opposed to the new Dead on Accurate (DOA) version with the delayed markings. All of the Elite Bushnell 4500 rifle scopes are O-ring sealed and argon-purged for 100 percent waterproof, fogproof and shockproof protection. These scopes are guaranteed to perform in the wettest and dimmest of hunting situations and in addition, the Elite 4500 4-16×40 rifle scopes can withstand absolute immersion in water and still stay dry inside. Also, the interior optical surfaces won’t fog due to extreme temperature change or humidity. The 6-24×40 rifle scope by Bushnell is another high-grade addition to the Bushnell Elite 4500 series. It’s perfect for long-range shooting or varmint hunting and offers a 40mm adjustable objective lens for a handy parallax focus from 10 yards and beyond. Multiple layers of coatings reduce the sun’s glare allowing for an optimal view of your subject. In addition, semi-target turrets provide a low turret figure and are easily adjusted. The 6-24×40 also features a sunshade to not only minimize the sun’s glare, but it also protects the front lens from scratches and scuffs. Tested to endure 1,000 rounds of a .375 Magnum, this rifle scope is a trusty companion that won’t let you down. In summary, the Bushnell Elite 4500 rifle scopes are engineered to withstand rugged shooting as well as whatever nasty weather conditions that may come their way. Besides their exquisite optical benefits, the Elite 4500 series has been redesigned to be more lightweight, sturdy and compact. In addition to argon purging the one-piece tubes for reduced thermal shock, the rifle scopes are 100 percent waterproof and fogproof. With pristine anti-reflective coatings plus Ultra Wide Band Coating, you’ll gather optimum brightness and gorgeous color across the light spectrum. The Elite 4500 rifle scopes are available with two kinds of reticles (Multi-X and DOA 600), which equips aiming points from 100 to 600 yards and a generous eye relief. When it comes time for your next hunt, consider the Bushnell 4500 series rifle scopes. They’re not only compact, sturdy and reliable, they come with a nice affordable price tag and bulletproof warranty. If you don’t believe us, try one for yourself … the choice is easy! Bushnell is a brand of Vista Outdoor Inc.